When Chad Robertson and Elisabeth Prueitt opened their tiny Tartine Bakery in 2002 in San Francisco’s 18th Street (at Guerrero), who would have bet that locals would fall so hard for their small batch artisanal loaves? 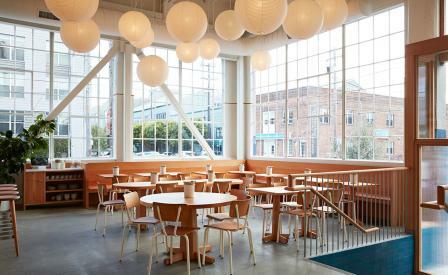 The intrepid duo have now parlayed their bijoux business into a sprawling new outpost in the Mission District. The LA-based design firm Commune has converted a corner of the Heath Ceramics factory into a gastronomic destination comprising diner, bakery, bar, coffee shop, and ice-cream stand. Lit with natural light streaming in through the high windows, the 15,000 sqft space is lined with unglazed subway tiles, Calacatta marble counters, high-backed banquettes and reassuringly raw concrete floors. On-site grain mills and Hydra mixers feed the giant Heuft oven that turns out two to three fresh bakes of sprouted grain and country loaves every day, while the Tartine Cookies & Cream, fronting Alamaba Street, churns buffalo milk into seasonally flavoured soft serves, and ice-cream sandwiches.